On Friday 14 December 2018, John Barilaro Deputy Premier Minister for Regional NSW Minister for Skills Minister for Small Business Member for Monaro announced that the NSW Government will build a public high school at Jerrabomberra. It is expected to open in three (3) years. What is planned for the Poplars? Chris Daley from Black Mountain Construction Assurance and David Maxwell from the Riverview Group will be giving an over view of what is planned for this area now known as the Marketplace at Botanical’ at the 20 June 2018 JRA Meeting, 7:30pm. South Jerrabomberra will soon be home to a new commercial neighbourhood centre, with early works now commenced on ‘Marketplace at Botanical’ Stage 1 by developer, Poplars Developments Pty Ltd.
Work is planned to start in December 2018 and be completed in December 2019. Roads and Maritime Lanyon Drive and Tompsitt Drive intersection improvements. The JRA does not support the construction of the EDE. 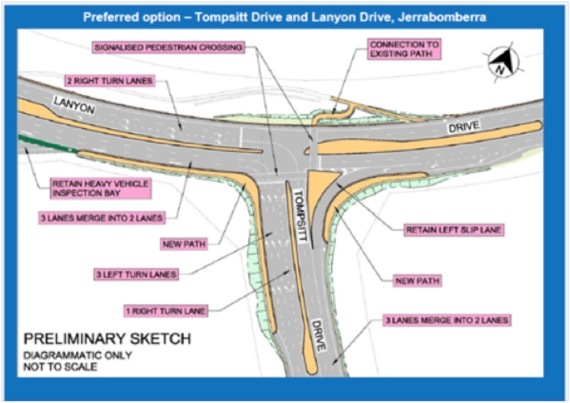 We are concerned that construction of the EDE will result in the Edwin Land Parkway being used as a Queanbeyan by-pass, effectively cutting our suburb in two with a dangerously busy road. We also believe that the cost of the road will blow out and this burden carried by rate payers. We strongly believe that construction of Dunns Creek Road and modification of a number of intersections will be a better solution, this could include the Northern Bypass. We fear by failing to plan now for Dunns Creek Road (including funding the construction costs), the EDE will destroy the tranquility Jerrabomberra residents enjoy today and divide our suburb into the future. Where else in the world have government authorities, at any level, deliberately set out to divide a settled family-oriented suburb with a town bypass? Where is Dunns Creek Road? Jerrabomberra residents are all too familiar with the impact aircraft noise has on their daily lives. This has become a major problem since December 1995 when, at the request of the ACT Government, the flight path was changed and all planes were funnelled down the western side of Jerrabomberra. No consultation was made with Jerrabomberra residents and they were not informed of the change. The Instrument Landing System (ILS), or the flight path centre line, goes from Church Creek along the western part of Jerrabomberra to the end of the runway. With over 600 Jerrabomberra residences currently falling outside the current noise abatement area, aircraft noise is a regular concern to all Jerrabomberra residents as aircraft noise does not stay outside the noise abatement area and Canberra Airport currently does not have a night time curfew. The JRA has been working with Canberra airport and our Federal, State and local representatives since 1995 to minimise the impact of aircraft noise on our community. Together we have been able to find solutions to minimise the impact of aircraft noise on our community without impacting on the proposed growth of Canberra Airport. A summary of these are below. The new Required Navigation Performance (RNP) procedures have been implemented on 2 May. Qantas and Virgin are now more likely to use the RNP procedures for Runway 36/17 with their B737-800 fleet and RAAF 34 Squadron with the Boeing Business Jet. This means further noise abatement for Jerrabomberra on Runway 35 arrival as planes fly the “Jerrabomberra By-pass” which goes around Jerrabomberra. It also provides Virgin aircraft with the ability to approach the Airport from the north onto Runway 17 with a lower decision height minima using the RNP/Smart Tracking. Qantas Boeing 737-800 aircraft commence using RNP technology to operate a curved noise abatement approach to Runway 35. These aircraft now bypass Jerrabomberra on arrival and instead fly over and noise impact rural areas of Tralee and Environa. Aircraft arriving and departing the main Runway 17/35 stay inside the High Noise Corridor, reducing high level aircraft over-flight of residents in Tuggeranong and Gungahlin. Overnight freight operators required to use Runway 17/35 rather than Runway 12/30 between 11pm and 6am. Similar agreement reached with the Royal Flying Doctor Service/NSW Air Ambulance other than for emergency. Aircraft departing Runway 17/35 stay inside the High Noise Corridor for longer before they turn onto track to their destination. This has ensured reduced high level aircraft overflight of residents in Tuggeranong and Gungahlin. New circuit procedures on Runway 12/30 to ensure minimal aircraft noise impact to residents in Pialligo and North Canberra. Arriving aircraft on Runway 12 join their final track no later than the War Memorial to reduce noise over North Canberra. Amended arrival procedures to Runway 30 arrival from the east to provide noise respite to the rural residential areas of Carwoola, Captains Flat Road and the Ridgeway. Aircraft directed mainly over currently unpopulated western areas of Kowen Forest. For light aircraft travelling to the training area near Bungendore, aircraft travel at an altitude 500ft higher than previously flown. Runway 30 Revised departure procedures for Runway 30require light aircraft to track over Fairbairn Avenue to the War Memorial before turning, avoiding disturbance to residents of North Canberra. Between 8pm and 7am Runway 17 from the north is the preferred arrival runway when weather conditions permit. This measure ensures that over-flight of Jerrabomberra residents is avoided overnight whenever possible. 12-degree offset departure flight path, ensuring aircraft taking off to the south on Runway 17 fly away from Jerrabomberra towards the western side of the High Noise Corridor, over rural land at Tralee and Environa. Less overflight of Canberra residential areas by arriving and departing aircraft. Jets in the Noise Abatement Area may not fly below 5,000ft (1,524m) above ground level and large propeller aircraft may not fly below 3,000ft (914m) above ground height, except in exceptional circumstances. Canberra Airport Community Consultation Group is a group of airport stakeholders (e.g. the airport operator, government agencies of various levels, community representatives, aviation and business representatives, etc.). The objective of this group is that it allows the flow of information from the airport operator and its tenants to the community and vice versa provides a forum where the community has an opportunity to make comments and suggestions regarding the operation and development of its airport. The JRA is a member of the Canberra Airport Community Consultation Group. With the Aircraft Noise Monitor located at the Jerrabomberra Tennis Court, you can track each flight into and out of Canberra Airport using fantastic interactive tool Web Trak.